Russell Westbrook had a triple-double as the Oklahoma City Thunder held on for a 109-104 win over the New Orleans Pelicans on Sunday at the Smoothie King Center in New Orleans. Westbrook finished with 26 points, 15 rebounds and 13 assists as the Thunder ended a three-game losing streak. Paul George added a game-high 27 points, Carmelo Anthony had 16 points, Steven Adams 14 and Jerami Grant 12. Anthony Davis had 25 points and 11 rebounds, Ian Clark scored 16, E'Twaun Moore had 15, Darius Miller 14, Jrue Holiday 12 and Rajon Rondo 11 to lead the Pelicans, who lost their fourth straight as they try to cling to the eighth playoff spot in the Western Conference. New Orleans committed 21 turnovers, leading to 18 Thunder points, as it lost to Oklahoma City for the first time in the finale of the three-game season series. 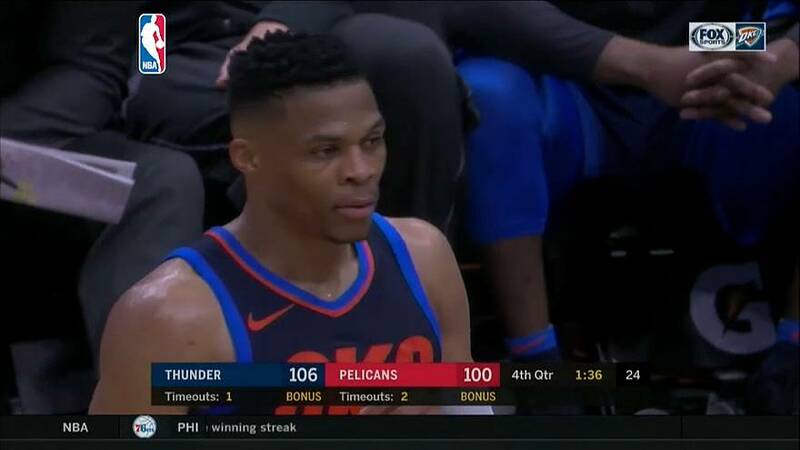 The Pelicans scored 13 points on 17 Thunder turnovers. The Thunder led by three at halftime. Westbrook scored five points early in the third quarter as they took a 63-56 lead. The Pelicans evened the score at 63 before Westbrook made three free throws to start a 9-0 run by Oklahoma City . The lead reached 10 but Clark and Miller each made a 3-pointer as New Orleans cut the lead to 80-75 after three quarters. The Pelicans got within three, but Grant scored four as the Thunder took a 92-83 lead. Anthony's jumper increased the lead to 102-90 with 3:23 remaining, but Moore scored four points and Miller made a 3-pointer as New Orleans got within 104-99 with 1:57 remaining. A layup by Westbrook and a 3-pointer by George helped the Thunder hold on as both teams went scoreless in the final minute. The Thunder went scoreless for 6:12 and the Pelicans took advantage with a 16-0 run to build a 28-20 lead after one quarter. George scored Oklahoma City's first 11 points of the second quarter and passed to Westbrook for a dunk that gave the Thunder a 35-33 lead. Davis' dunk pulled New Orleans even before Westbrook scored six points to help Oklahoma City take a 53-50 lead.